JYJ have won the honor of topping the weekly Social Charts. According to Olleh Music on the 18th, JYJ’s ‘Get Out’ has topped the weekly Social Charts for the third week of September (9/11~9/17). Second place went to Beyoncé’s ‘Listen’ while third was Celtic Woman’s ‘Nella Fantasia’, a track chosen by Park Colleen in her compilation album. These were followed by Sung Si Kyung’s ballad ‘Oh My Goddess’ in fourth and Josh Groban’s ‘Hone To Stay’ in fifth place. The second half of the 2011 Peace Star Cup, a celebrity soccer team competition, kicked off on the 17th at the Suwon World Cup Stadium. With FC MEN clinching the ultimate victory in the first half of the year, a fierce battle has begun amongst the players once more to be crowned the winners of the second half of 2011. Anticipated as a match between the power of young idols and the expert ease of older veterans, the first matched ended with an unexpected landslide victory by Superstars as they beat FC MEN by 5:1. Scoring two goals in the first half and three more near the end of the match, Superstars easily beat the energetic idol team. Though many had anticipated FC MEN to pull through in the second half, it ended with one penalty kick by Park Jung Jin. But the spirited play by the blonde-haired captain Kim Junsu and the other players had the 1,300 spectators showing their support and enjoying the game. Kim Yong Man’s Miracle FC and Seo Kyung Seok’s FC Libero, eternal rivals of comedy, had a fun but tense match that ended with a 2:0 victory by Miracle FC. The players’ funny goal ceremonies and exemplary sportsmanship had the spectators rooting for both teams. MBC Sposrts+ will be airing today’s matches and the broadcasting dates can be checked on the competition’s homepage (www.peacestarcup.com) to enjoy the funny commentary by comedian Kim Kyung Min and anchorman Shin Seung Dae. The preliminary rounds will be held from the 27th of September till the 11th of October and the king of all kings of the second half of 2011 will be decided on the 15th of October. And here’s the newly released MV of “Get Out”. Here’s the MV of “In Heaven”. This MV reminds me of one of my favorite movies entitled “If Only” starring Jennifer Love-Hewitt. It somewhat has a similar story. I’m happy that they actually asked Junsu to be the male lead in the MV since we still haven’t seen him act in a drama but I would have also wanted to see a glimpse of JaeJoong and Yoochun in the video. I’m back – well, at least for today. I haven’t been able to update this blog because of my busy schedule at work. We’re currently on a “transition period” due to having a new boss and thus, we have to do a lot of adjustments that entails a lot of work and energy. But no matter how busy I am with work, I still try to look for updates on JYJ (though I don’t get the chance to share these updates on this blog) and I’m actually happy for them because they’ve been garnering a lot praise recently due to their newly released Korean album entitled “In Heaven”. I won’t be giving a thorough review of the album since I know a lot of sites already did that and I’m sure most of the JYJ fans already heard all the songs in the album. I just want to congratulate JYJ for another successful album. Their hardwork surely paid-off because “In Heaven” is a masterpiece that offers a variety of songs that did not fail to impress its listeners. JaeJoong, Yoochun and Junsu are geniuses for being able to put up an album as great as this. Indeed, they are no longer fitting to be called only as “idols” but now they have proven that they are great “artists” who can do well in all aspects of music, their chosen field. Talking about my favorites in this album, I actually have a lot. I LOVE “In Heaven”, “Get Out” and “The Boy’s Letter”. 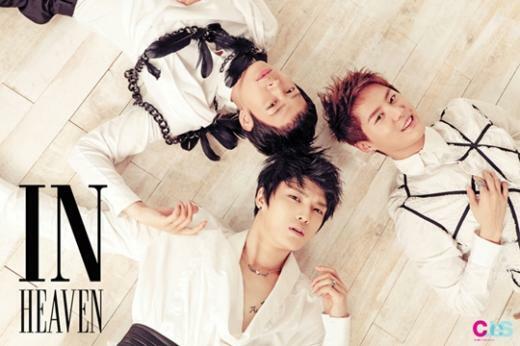 “In Heaven” is a song showcasing the power of JYJ’s vocals and their great harmony. The bridge part never fails to amaze me no matter how many times I listen to it – it never fails to give me chills (in a good way). “Get Out” is a pretty catchy song and I like its melody. The transition of the melody from slow to fast and the accompaniments are just perfect. “The Boy’s Letter” is a song that would be perfect to be used as an OST for a drama. I can imagine listening to it as a background music for a dramatic scene. I also love Junsu’s high notes towards the end, they’re so spot on.